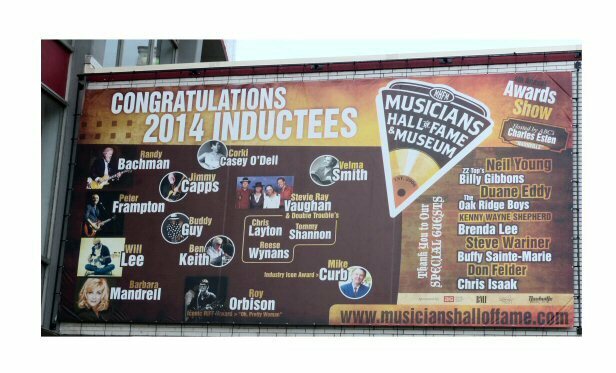 The Musicians Hall of Fame (MHOF) is located at 401 Gay Street in Nashville, Tennessee. It is a unique Music City attraction that not only honors the front men but the equally important but lesser known sideman who have played on the greatest recordings of all time. 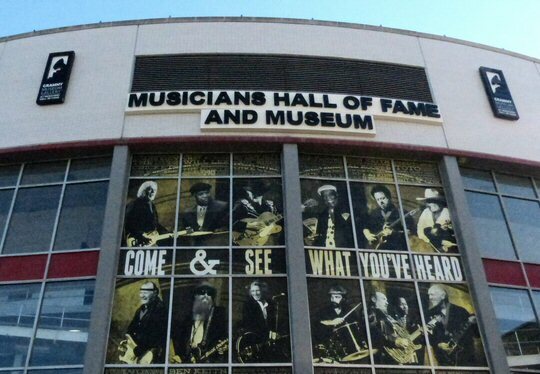 The museum is located below the Nashville Municipal Auditorium that has hosted concerts from Aerosmith to Willie Nelson. The MHOF spans decades to showcase a diverse range of music starting with the The Fisk Jubilee Singers. The a-cappella ensemble started in 1871 to raise funds for Fisk University which was established to educate African Americans soon after the Civil War. The Fisk Jubilee Singers still tour sharing their culture and spiritual songs with the world. The MHOF located inside of the Nashville Municipal Auditorium. We had the pleasure of visiting the MHOF on November 18, 2016. A short film narrated by Duane Eddy welcomed us to the museum. Duane Eddy was known for his twangy guitar sound that was heard on a number of chart toppers from the late 1950s and early 1960’s. Duane reminded visitors that plenty of notable rock platters by the likes of Bob Dylan, Paul McCartney, Neil Young and more have been recorded in Nashville – a city generally known as the Capital of Country music. 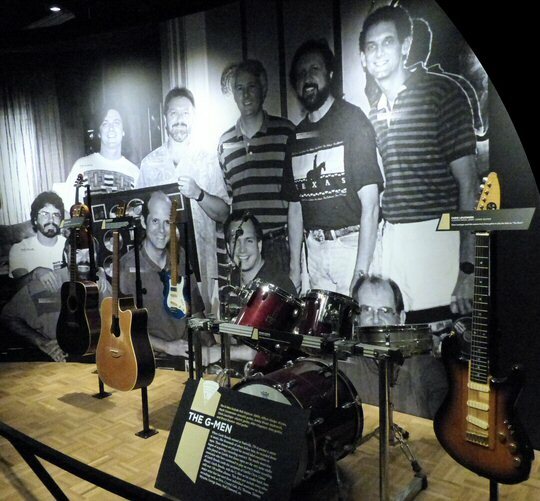 Some of the first displays we encountered in the Nashville Hallway at the MHOF were dedicated to guitar innovators Chet Atkins and Steve Wariner. Nashville flows into Memphis home of the American Sound Studio where hundreds of hits songs were made during its brief existence (1967-1972). The exhibit has the actual studio vocal booth along with part of an interior wall and some instruments. Artists who recorded there include Elvis, Neil Diamond, Aretha Franklin and The Box Tops. The Stax Recording Studio has gear used by Sam and Dave, Otis Redding, Eddie Floyd along with Booker T. And The M.G.s. Instruments, information, records and more are also found in the Atlanta, L.A., Motown, Muscle Sholes and Sun exhibits. 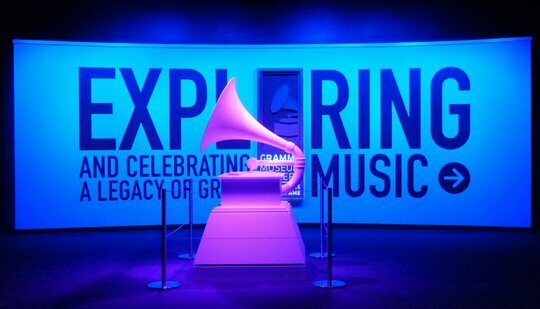 The GRAMMY Museum Gallery is a new, dynamic addition to the MHOF. Also of note is a ’67 Fender that belonged to Jimi Hendrix along with an early photo of Jimi playing at a local Nashville club. Also sighted were Ravi Shankar’s sitar, pedigreed pianos and a case dedicated to inventor Les Paul. 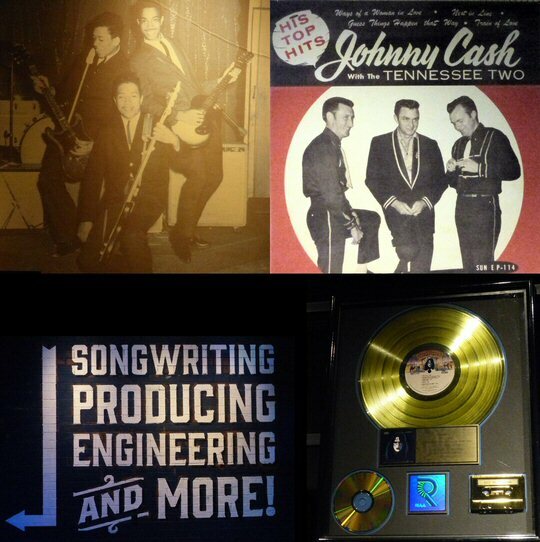 BMI awards, gold and platinum records are showcased throughout the MHOF along with tributes to session players. The entrance and exit to the museum features an Edison to iPod Exhibit outlining the transition from phonograph, to record players to the hand held devices of today. The Grammy Museum Gallery is a newer addition to the MHOF. It has plenty of interactive displays that has Nashville partnering up with Los Angeles to expand the historical offerings. The Grammy Award Gallery and Video Hall explains what the Grammy is. The display includes five designs of the award through the years along with a looping video of Grammy performances. The Roland Live Stages allows visitors to play drums, guitar, keys and more. The Ray Charles Stage is ready for karaoke. Other rooms are set up to learn and listen on a variety of topics such as songwriting, producing, engineering, singing, rapping and recording. The exhibits concludes with a timeline which of course will be added to each year with new winners. Garth Brooks and the G-Men are a part of the 2016 class of inductees. The MHOF is also an award given by the American Federation of Musicians and industry pros in recognition for accomplishments in engineering, producing and musicianship. On October 26th the class of 2016 was inducted. Topping the list was Garth Brooks & The G-Men who also have an exhibit at the museum. Garth has been certified by the RIAA as the number one selling solo artist in US history but part of the credit belongs to The G-Men who have backed Brooks from the start. The Musicians Hall of Fame celebrates the achievements of musicians from the golden era of studio recording to the present. The MHOF focuses on the session players who may not be as well known to the public but were instrumental on thousands of iconic recording through the decades. The space is also available for events and the auditorium still hosts concerts. Sting is scheduled for a March 29, 2017 appearance in the hallowed hall. The MHOF is an educational and entertaining resource that belongs on ones list of attractions to see in Nashville. The MHOF includes Jimi Hendrix and Johnny Cash rarities and more!